I made this graphic on Microsoft power point. I always enjoy utilizing Microsoft Powerpoint because the program has has a really cool feature with pictures AND videos assessable to anyone who has the program. Under “Format Picture” there is an option to “remove background”. This gives you the option to cut from any photo. I like using powerpoint because I don’t have to worry about things like margins or overlay. 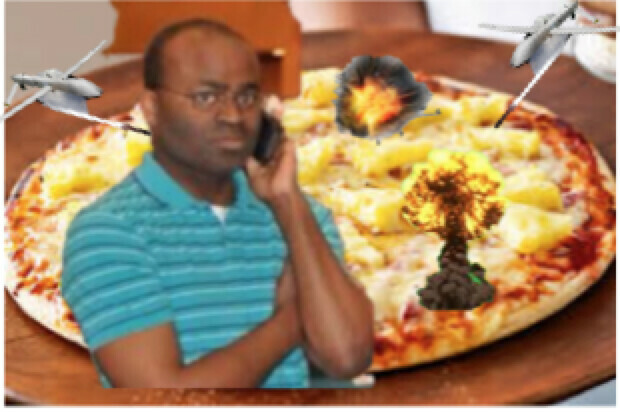 My mans over here calling in a drone strike on the pineapple pizza…. Woho!!!! Thanksgiving and Christmas are coming up ya’ll! 🙂 Its that time of year. This is my holiday mashup. My three favorite holidays are Easter, Thanksgiving, and Christmas! I created this graphic in a photo shop app on my iPad called Faceover. It was on one dollar too! Santa’s sleigh is being steered by the easter bunny, who has a trunk full of turkey dinner!!! yum!! lol. I hope you enjoy my creativity! Hola amigos de ds106. Este es mi remix de mashup de vacaciones. Mis 3 vacaciones favoritas son Navidad, Semana Santa y Acción de Gracias. Yo creó este gráfico en una aplicación de tienda de fotos en mi iPad. El trineo de Santa está siendo dirigido por el conejito de pascua, que tiene un tronco lleno de cena de pavo. ¡Espero que disfrutes de mi creatividad! Now this is my type of assignment!!! LOL.. I literally narrate my dogs whole life all day long.. The doggo featured in this video in my one year old Irish doodle, Murphy! You may remeber him from past assignments I’ve included him in. I created this movie on MovieMaker. Im sure I am not the only one who cowers in fear whenever you have to make an edit of a video..prior to this class I had never even know I had access to this program. It comes free on all apple laptops and is super simple and easy to use!